It was the year of the last great flood of Bath when a young Brenda Oliveira started work at the Royal National Hospital for Rheumatic Diseases, known locally as the Min, in the city centre. Tom Jones was in the charts with Delilah, Lyndon Johnson was US president, the world had its first sighting of a jumbo jet – and Brenda had no idea how long her new career would last. The answer – 50 years, and counting. All at the RNHRD in Bath, known as the Min, all as a health care assistant and all on the night shift. 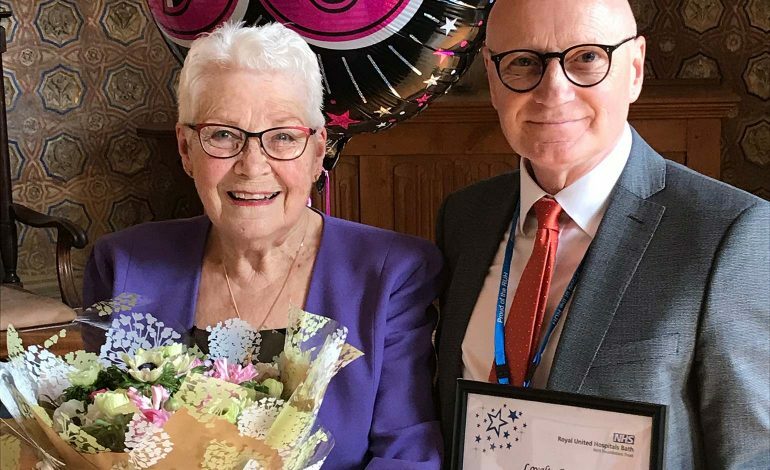 Brenda was guest of honour at a celebration party at the Min, where family, friends and colleagues raised a toast and presented her with flowers, a long service certificate and commemorative glass award. Amanda Pacey, RNHRD Matron said: “Other matrons and sisters I speak to are amazed at Brenda’s story and so envious that she has stayed with us for so long. “I think it’s because of the sort of family we are here, we always rely on each other and help each other. Brenda, from Widcombe in Bath, is now, finally, planning to call it a day later this year. She plans to spend more time with Ollie, her husband of 63 years, and their four children, six grandchildren and four great-grandchildren. She said: “I’ve loved it here. It’s a hospital with a family feel where you get to know your patients over a long period.